Eagle River is a community about a half hour north of Anchorage and offers some great hiking and entrances to the Chugach Mountains. 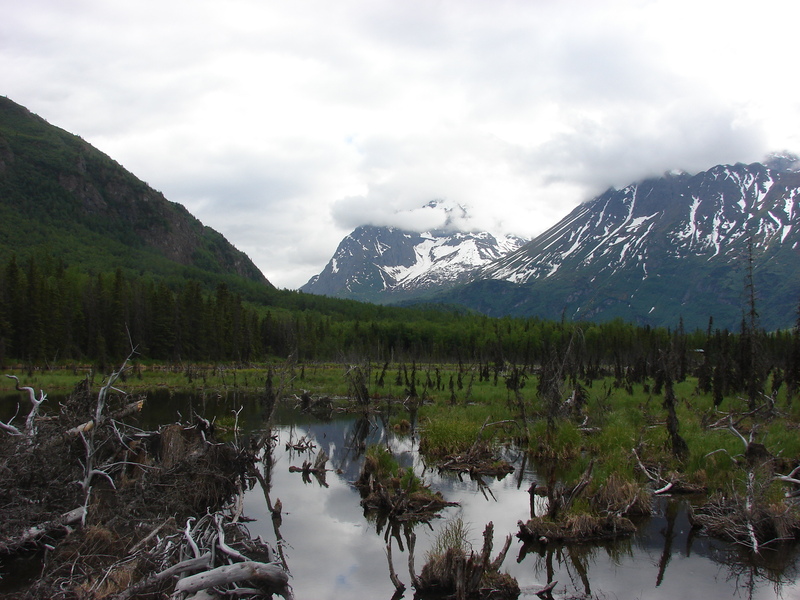 There is a wonderful Nature Center at the end of a 12 mile paved road which follows the North Fork of the Eagle River up into the valley toward Eagle Glacier. The valley is home to both brown and black bear, beaver, wolverine, moose, and wolf to name a few…not to mention spawning salmon in the later summer months. In fact, the State maintained trails closest to the river and spawning grounds are closed to pedestrian traffic when the salmon are running due to the high concentration of bears coming to dine. These closures are for the protection of both the bears and the people. Joanne (caching handle Meljo) and I headed out for some geocaching fun in Eagle River. Having arrived at our first destination, we found road construction and associated crew/vehicles (welcome to summer in Alaska) surrounding the pull off that was to be our parking area for the first few caches. We squeezed in among the trucks and trailers etc and set about gathering our gear and dogs for a trek into the woods and along the river. A nearby flagman kept an eye on us and when he realized we two middle-aged ladies were about to head off into the woods, he hollered over to us that there had been a brown bear wandering around the area earlier. Hmmmm. How long ago, we asked. About 2 hours, he said. Well, that bear could be all the way in another valley by now we thought and we’ve got caches to get, so off we set waving thank you to the man who just stared after us with who knows what on his mind. People trails are non-existent in this particular section of wilderness, so we made lots of noise while bushwhacking from one negligible game trail to the next, bear spray at the ready. Fortunately for us, we found all three caches we were looking for and saw no bear nor even any evidence of bear…at least not during this portion of our caching day. Later, on our hike out from the Nature Center, we saw and happened to follow some black bear tracks (they were headed the same way we were), but did not ever see their owner. It just goes to show you that bears are everywhere here in Alaska. Just the other day I saw a beautiful black bear cross the street in a heavily populated residential area. Joanne and I enjoyed several hours of hiking and caching in Eagle River. Another wonderful day in Alaska. 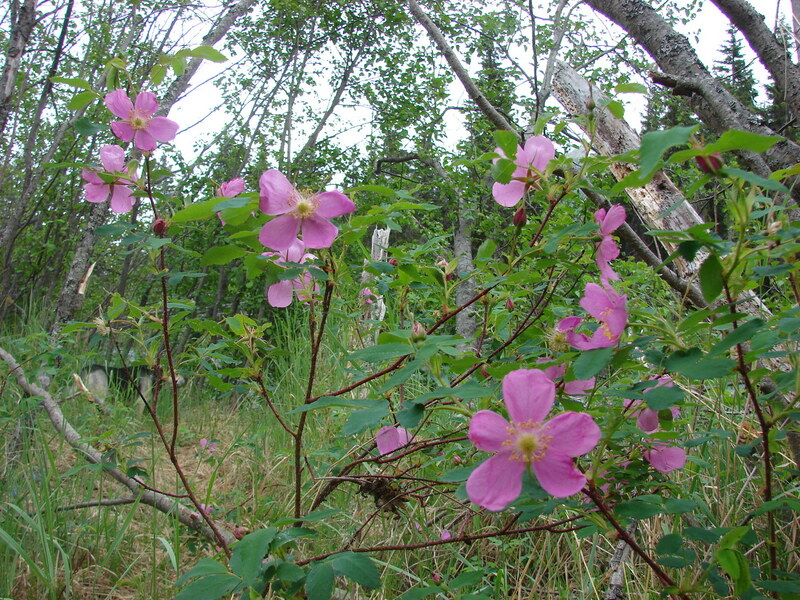 I’ve included some photos below: Sitka roses which grow wild all over, a beaver made pond of sorts which is one of many area salmon spawning grounds, and a cast of a brown bear footprint from the Nature Center. Yes, it is a real cast made from a real and actual foot print. 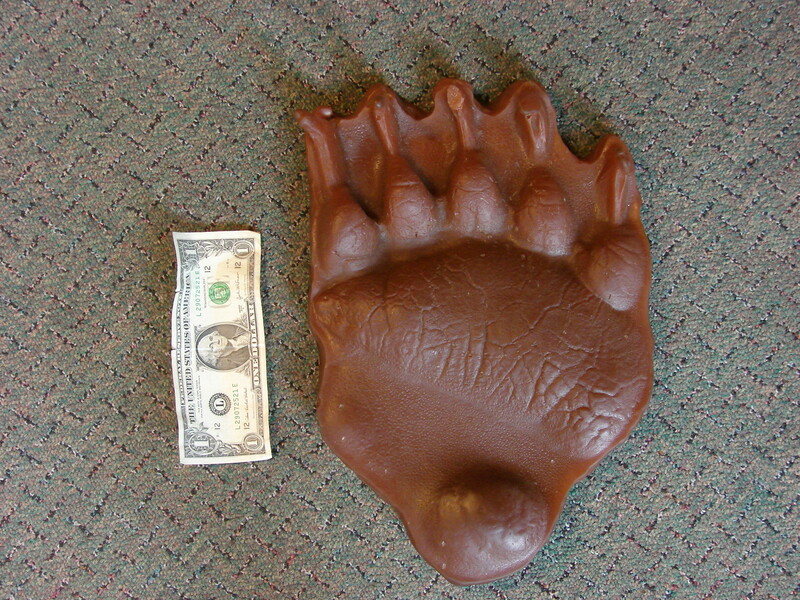 Note: the cast is of a Kodiak Brown Bear, so it is quite a bit larger than ones found anywhere but on Kodiak Island. Goodness, how would you like to run into that bear? During my three weeks working and hiking on Kodiak last August, I must say I have never been more bear aware than at that time. They sure do grow ’em big over there! Uh oh…..need an explanation of “caching.” At one time, we were on a “caching” web site in Knoxville where you were given hints as to where a cache of odd little items were hidden. When you found the cache, you took an item and then left something behind. We planned to do it and even had a jar to hide our own cache but due to various reasons, never got around to it. Is this the same type of thing you are doing or is it entirely different in Alaska? Thanks for sharing………..yep, a BIG mother bear!!!! Yes, it sounds like the same thing. Its basically a high tech treasure hunt that takes place all over the world. There are well over 1000 geocaches hidden in the Anchorage bowl. I myself have found over 1000 caches in multiple states and countries. What fun. You can read about it further at http://www.geocaching.com. Just got back from backpacking 275 miles on the AT with multiple bear encounters. The acorns fell too early so the bears are getting very aggressive due to hunger issues. No bears with a paw print like that though! I am loving following your adventures! I need to get to Alaska…. So good to hear from you Heather! Wow, another big section of the AT under your belt. Way to go. I know Jay’s trail name was Sketch, but I never learned yours. What is it and was it the same this time as last time? I’d love to see a photo or two and hear a tale or two about your trip and hope to get to see you when I land in NC sometime this Fall. I’m glad you finally found something to write about in this big ‘ol boring state we live in.